Drobo has launched a new product into its Direct Attached Storage (DAS) portfolio. 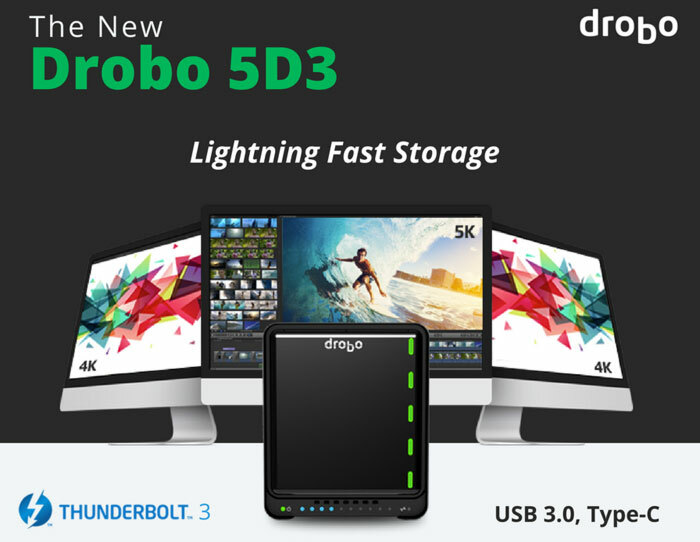 The new 5-bay Drobo 5D3 storage solution uses Thunderbolt 3 connectivity and offers a 2X performance boost beyond what the award winning and popular Drobo 5D can muster. 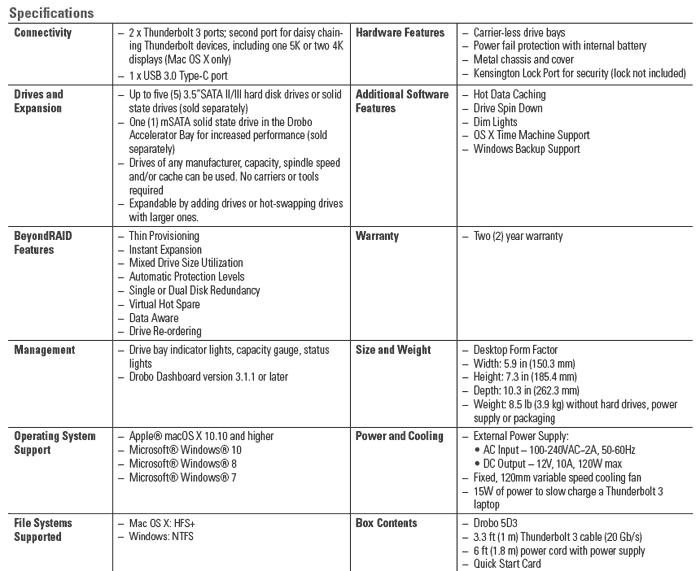 Thanks to Thunderbolt 3, the Drobo 5D3 can offer much more than storage related functionality, for example it can also work as a dock providing further Thunderbolt / USB ports, and connect up to 2x 4K monitors. Up to six Thunderbolt 3 devices can be daisy chained and there will still be enough power to (slow) charge a laptop. The Drobo 5D3 is targeted at professionals and small businesses which would benefit from superior performance and high capacity storage for fast media creation and editing, and/or a central backup location. Using the additional mSATA Accelerator Bay "increases performance by over 30% for frequently accessed data," says Drobo. Drobo has designed the 5D3 with a metal array, featuring carrier-less drive bays, a magnetic faceplate, and an intuitive LED display for intelligent management. Drives can be hot-swapped without tools. Another user friendly feature is the built-in battery pack which enables your Drobo to move any in-flight data to onboard flash if a power outage occurs. The Drobo 5D3 is available today at an MSRP of £749 via select channel partners.